Stoneledge Farm is a 200 acre, certified organic farm located in the foothills of the Northern Catskills, Greene County, New York. The original farmstead and greenhouses are located on 50 acres of mostly wooded land supported by a stone ledge running just below the soil surface. The farm fields and main barns are located nearby on an additional 150 acres of prime agricultural land adjacent to the Catskill Creek. 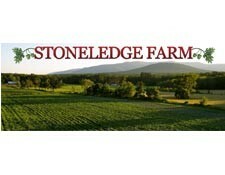 Stoneledge Farm has been a Community Supported Agriculture, CSA farm since 1996. Our family worked to build our farm and the farm grew with the support of the CSA membership.